Current State of AffairsIn the United States, there are six bills currently in fair-to-wide circulation: $1, $5, $10, $20, $50, $100. 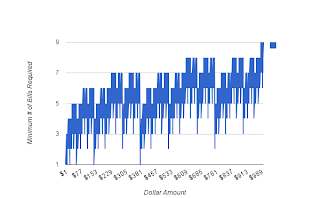 If you were to always use the biggest bills possible, then the average number of bills you would use on a given transaction where the total was less than $1000 (this is also assuming that all dollar amounts are equally likely) is 8.71. 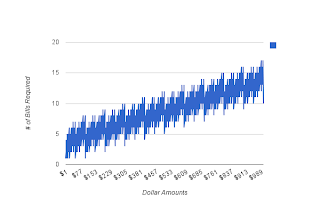 The most number of bills you would need would be for $999 => 9 $100 bills, 1 $50 bill, 2 $20 bills, 1 $5 bill, and 4 $1 bills. That's 17 bills. We can take that number down to 13 by introducing the $500, which I did for comparison's sake. As you can see, the average number of notes for that set-up is 6.702. The 'Efficiency' number is just averagebills * totaldenominations. In this case: 6.702 * 7 = 46.914. And, as said earlier, Max Notes is 13 since 5 $100 bills can be replaced with 1 $500 bill. Of course, there is room for improvement with anything, even in a monetary system crafted and propagated without competition or accountability by a pseudo-governmental entity over the past 100 years. Our standard system doesn't do so bad, especially for small values. 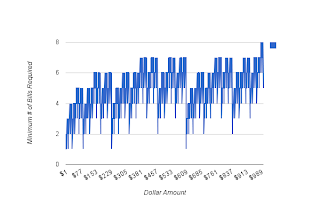 While it is still the least efficient of the five, it averaged only 4.21 bills for any dollar amount $100 or less. Not bad. 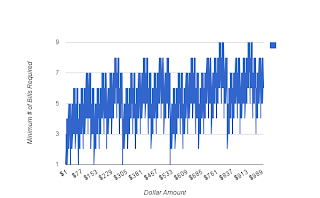 Aside from this lowering the average number of bills across the board, it also makes the dollar bills more uniform, making it easier to divide things out consistently. For example, if there were three of you, and you needed to divide $27 between the three of you. Sorry, you have four? My theory totally falls apart. What about dollar amounts being perfect squares? The squares that I picked worked a little better for values under $100, but still outperformed the standard at both levels. Then, the Fibanocci numbers occurred to me as being a viable option since they were an arithmetic sequence as opposed to a geometric sequence. Using all of them up to the necessary 300 or so was too many, so I tried every other. And the winner is: The other every other Fibbanocci number! This had an amazingly low max, standard deviation, and overall average. On average, you would only need 5 bills from here to $1000. Amazing. 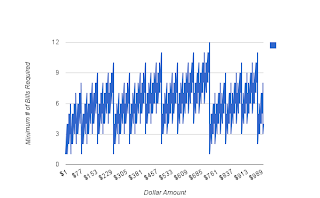 Under $100, it also performed the best averaging only 3.34 bills per dollar amount. I'm sure that no one will mind needing to pull out an $89, 2 $5s, and a $1 to give a friend $100. Hey, it's more efficient!